Looking for something extra special for your event and love a touch of vintage flair? We currently have two beautiful Bedford CA ice cream vans in our fleet (Belle and Ema) as well as a stunning brand new 'vintage inspired' ice cream van (Skye). Over the past few years Belle and Ema have travelled to events all over the country, attracting excited crowds aplenty along the way. We found each of them in a rather sorry state and, determined to capture every single ounce of their former glory, their restoration has been a real labour of love for us. Steeped in British nostalgia, we have worked hard to preserve their original features and believe the outcome is something truly special. 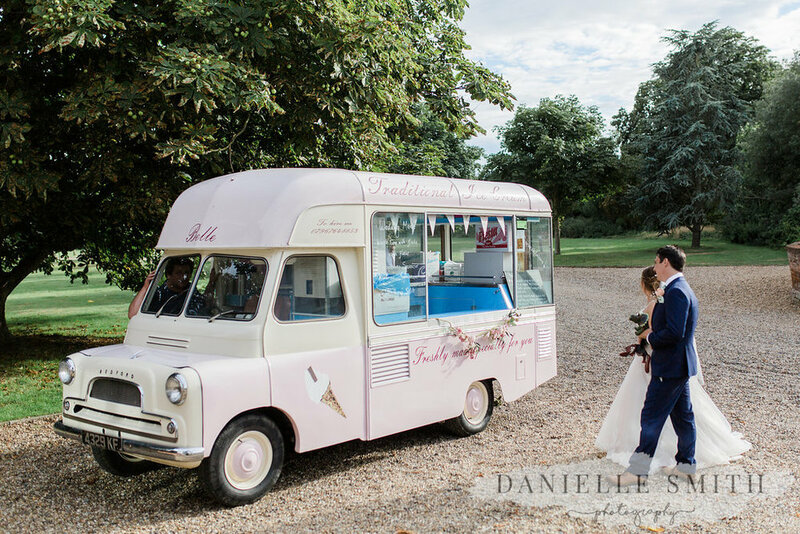 Decked in their finest bunting and pretty flowers our vintage ice cream vans for hire in Kent, Surrey, Sussex, Essex and London are sure to add that something special to your event, serving delicious local soft whipped ice cream in the finest quality waffle cones. We also serve a selection of retro ice lollies that will transport you back to your childhood days, from Strawberry Splits to Cider Refreshers. Belle and Ema are quite the show offs too and love nothing more than to pose for photographs. 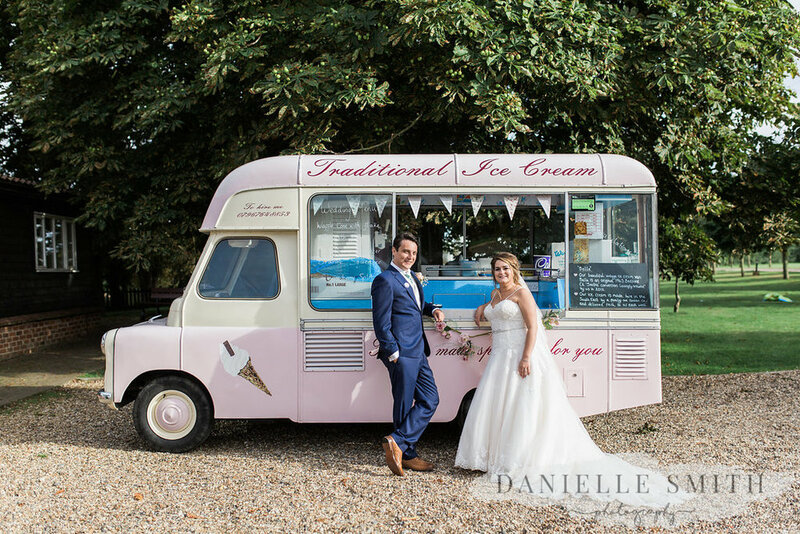 Whatever the occasion, there will always be an opportunity for unforgettable photos to be taken with our vintage ice cream vans. The team at Scoff & Sip will always go that extra mile to make your event truly special. The latest addition to our retro ice cream fleet is Skye - our brand new vintage inspired ice cream van that was custom built for us in 2016 with a vintage inspired body shape and design. Skye is a fantastic alternative to hiring one of our vintage ice cream vans and can often work out more cost effective for smaller events and more efficient for events that require us to serve lots of people in a short period of time. Scroll down to find out more about Skye. On Belle's menu: Delicious creamy and locally produced soft ice cream served on luxury waffle cones with Cadbury 99 flakes and a variety of tasty toppings including sauce, sprinkles and nuts. Belle also sells classic old favourites including oyster shells, pop-eyes, high balls and traditional ice lollies as well as soft drinks. In the winter months she pops up at Christmas markets selling luxury hot chocolate with Baileys and mulled wine. On Ema's menu: Delicious creamy and locally produced soft ice cream served on luxury waffle cones with Cadbury 99 flakes and a variety of tasty toppings such as sauce, sprinkles and nuts. Ema sells some classic old favourites including oyster shells, pop-eyes, high balls and traditional ice lollies. All of our vintage ice cream vans love to attend festivals, fetes, classic car shows, weddings, parties, corporate functions and more. To find out more about any of them or to enquire about hiring one of them for your event, please do not hesitate to get in touch and a member of the Scoff & Sip team will be happy to help.